This floor mosaic depicts Neptune upon his chariot pulled by four hippocampi. Neptune is the Roman equivalent to the Greek god Poseidon, and is known for his beauty and power. Neptune was a very important deity and considered the god of fresh and salt water. His large domain included all bodies of water, horses, and all sea-like creatures. The loyal servants of Neptune were his powerful and feared hippocampi, mythical sea horses that were just like land horses with the tail of a fish or dolphin in place of the hind legs. They are renowned for their power, and elegance. 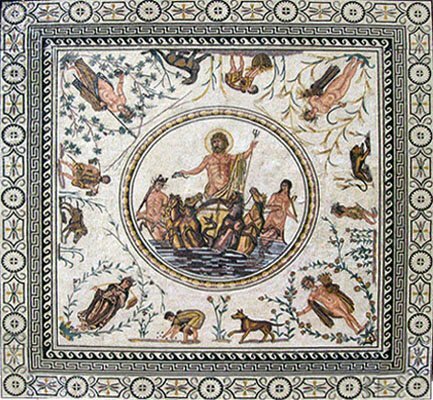 In the mosaic, Neptune is also accompanied by the gods Aphros and Tritan. Aphros and his brother, Bythos, were referred to as ichthyocentaurs, or ocean centaurs. As the sons of Cronus and Philyra, the two were known for their wisdom as teachers and were recognizable by their lobster claw horns. Aphros was also the eponym of the Aphroi tribe of Libya. On the opposite side of Neptune is Triton, a merman and the messenger god of the sea. He is the son of Neptune and Amphitrite and uses his conch shell horn to tame his father’s vicious waves. Triton and his brother, Jupiter, preside over the realms of heaven, earth, and even the underworld. The mosaic itself is known as the Neptune and the Seasons Mosaic. It was found in 1902 by D. Novak in La Chebba, Tunisia. The dimensions of the piece are 4.9m x 4.85m. It is made of limestone, marble, and glass tesserae that have an average size of about 2-4mm in the main image section of the piece, but increase in size closer to the outer edges. This beautiful floor mosaic can be viewed today in the Bardo Museum, in Bardo, Tunisia.